Helix is arranged from basic parts: walnut, brass and glass. The brass castings are used to create movement, radiating out from the center leg to the outer while lending greater depth to the design. 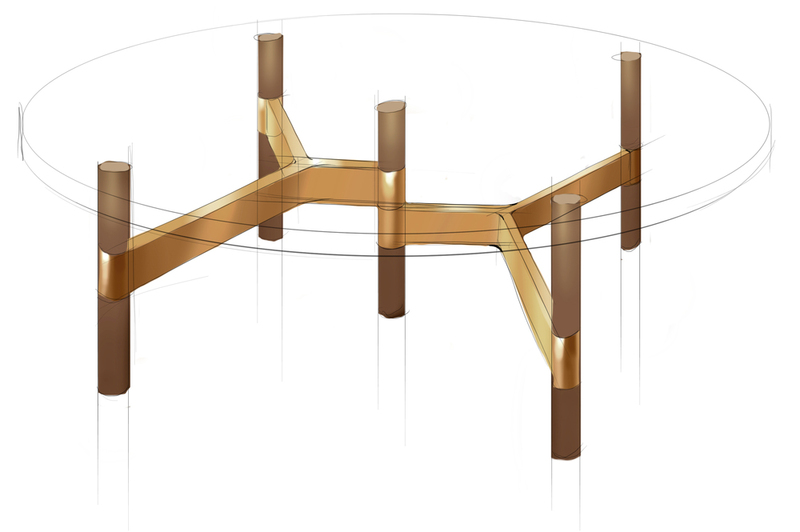 Both tables use an odd number of legs – five for the coffee table and three for the side table. This asymmetrical layering of material and form gives the design its character. Its name, Helix, references the composition of primitive shapes and materials forming elevations of movement. The Helix provides glass top options in round, oval and square, allowing the consumer to select a shape that suits them. Further, the piece requires no tools for assembly, so one can have the experience of putting it together with their hands.